Title might be a little confusing. Although it appears like a resolve 14 issue, it might be a BMMCC issue. PLEASE NOTE: It could also just be a brain fart - so I'm saying this up front for a defence of temporary insanity. I like to expose at ISO200 when I shoot beauty reels. (Or anything really). Because I like my skin/mid tones to be absolutely noise free, to allow me to lighten them up with out the image falling apart or getting noisy. It gives me headroom for pushing it stylistically in the grade. So I set my ISO to 200 in my BMMCC. Exposing it nicely, but when I've brought it into resolve, it's really dark. The metadata says it was ISO200, but I need to set it to ISO800 in resolve 14 to get the exposure that it appeared like at ISO200 in camera. It appears like I'm losing 2 stops of exposure when I hit resolve 14. In some shots I've noticed some noise creeping into the skin/mid tones. So that leads me to believe that I've only managed to expose enough light for an actual ISO800 setting. Not the ISO200. I was shooting at 60FPS, 90 degree shutter angle at ISO200. I have a photo of my EVF displaying the footage in camera and a screen shot of resolve's media page preview. Is this a resolve 14 bug, a BMMCC bug or me just losing my mind? Blackmagic Cameras are ISO-invariant when you shoot RAW. That means, the ISO you set in camera makes no whatsoever difference to the recorded image; it's just meta data. The only real indication for good exposure is the camera histogram. For low noise in the shadows, make sure that the histogram is as much filled as possible, i.e. that you expose the camera as much possible below the clipping point (also know as the ETTR principle). If your histogram shows, for example, a signal only in its first half, it means that you are underexposing by one stop and throwing away half of the signal quality that the camera can record. What timeline settings you use in Resolve? How do you convert footage from Log to Rec709 in Resolve? What monitor are you use? 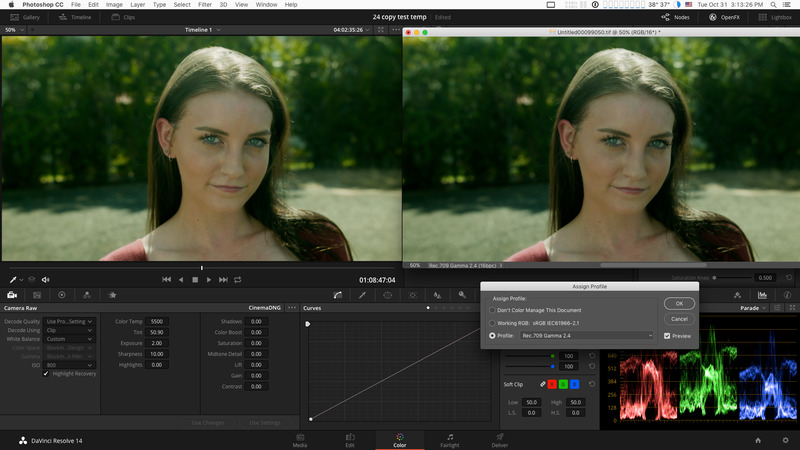 Did your monitor supports LUT, if yes, what LUT are you use to convert BMDfilm to Rec709? What brightness setting you use in monitor? Monitor Brightness setting acts similar to ISO and if you set high Brightness in dark enviroment you may fooled that the image is exposed correctly but actually it is not. Also try to make new project in Resolve 14. I noticed that when i open Resolve 12.5 projects in Resolve 14 for unknown reason all footage looks dimmed and underexposed because something is broken. Try 360 deg for 60p. Dwayne, not sure you can judge exposure on the Media page. But there isn’t any information in the sceeen shot that would indicate the problem. As indicated by Dmitry, we need a lot more information about the active project settings. A single DNG frame to download would help. Did it look this dark on the Edit, Colour pages? Hi, can you please post a sample DNG frame? Thanks! Just posting the link to the cinemaDNG frames. Probably about 50 frames here. Will respond to other replies shortly. Ok this is my colour management page settings currently. When I first created this project, I set my timeline colourspace to BMDFilm. But as it wasn't lightning up the image, I recreated the project and just left them at the standard settings. In Resolve 12 I would set my timeline to BMDFilm And I would switch off that checkbox nearby that used to say something about "Display Calibration..." I can't remember now, but it's missing in DR14. I discovered that setting my ISO from 200 to 800 brought the exposure to where I was expecting it to be. So I then just started tinkering from there. So I wasn't monitoring with an LUTS, and in this case I didn't apply any LUTS during my grade. I am using a new EVF by Kinotehnik, whereas normally I use my odyssey 7Q+, so maybe it's brightening the image dramatically? I have actually shot another test recently, and I didn't actually have any troubles with it. Same EVF. Yuri Gagarin wrote: Try 360 deg for 60p. Your frame is exposed to preserve highlight information in this high dynamic range scene. It is also huge amount of green tint caused by the ND filter or lens or green grass environment. You can recover up to 5 stops from shadows and extend dynamic range. But it is way more complicated than just drop footage to timeline. 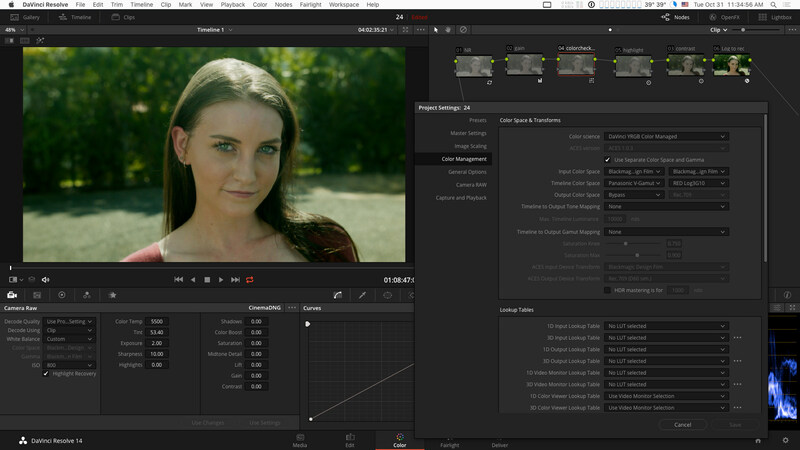 In perfect world you need access to full version of Davinci Resolve to use Temporal Noise Reduction. I shot this piece, same location, same lens, similar IRND (I think I used 1 less stop of IRND), same EVF, Resolve 14 beta and when I brought the footage in. There were no surprises. Looked exposed nicely at 200. Oh and it’s bitumen, not grass at that location. I do remember on my most current shoot (the DNG’s you have) that the camera was glitching where 90% of the screen went completely green. There was a strip at the top that appeared like the live feed. I switched the camera off and on again. Reset the EVF and it kept coming on green. Then I pulled the battery on the camera and it came good. Flickered a few more times and then didn’t give me any more grief after that. I normally don’t have this kind of grief. Thanks for the screenshot on the colour management. I’ll play around with that. I tend to like to get it into the BMD film space and then add my contrast and saturation on a shot by shot basis. Then saturate any specific colours (like greenery), and shift their hue a little, sometimes if there’s wood, I’ll do a hue vs hue to neutralise it a little if there’s a yellow cast. Kinda stretching the colour contrast in the scene subtlety when I can. I don’t really like to do a straight conversion. Yeah one day I’ll get the full version of resolve, I just like to set up my shoot to not rely on NR, to give it the most I can. More testing is required on my part I think. I think by exposing to iso 200 you may actually be losing detail in the shadows because the camera display sets the mid point lower. I know this is true in some other cameras. I always expose to native iso (800 for the bmmcc) because it will show me on the EVF something closest to what im actually capturing. I wouldn't do this of course on a camera whose iso is more than metadata. Thanks to your samples accidentally i found the proper profile that don't shifts gamma on still images exported as Rec709 from Resolve. Just assign that Rec709 Gamma2.4 in Photoshop or any other app, and then Convert image to sRGB. No more washed shadows when exported to web. One should never expose according to what looks visually right on the monitor, but observe the camera histogram. Dmitry Shijan wrote: Thanks to your samples accidentally i found the proper profile that don't shifts gamma on still images exported as Rec709 from Resolve. Just assign that Rec709 Gamma2.4 in Photoshop or any other app, and then Convert image to sRGB. No more washed shadows when exported to web. Hey that's really good to know Dmitry! Great tip! Yeah the colour tint is really strange. I only use IRND. Tiffen Water White. It's never been a problem before, because I'm quite obsessive about getting clean skin tones. Start off on the best foot, so to speak. Yeah I'm going to have to check this EVF against my Odyssey 7Q+ again. 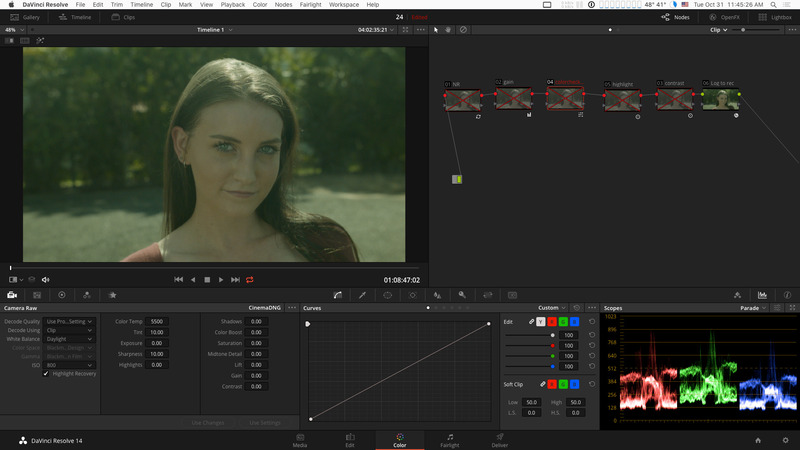 I usually like to target around IRE60 on my skin tones with no LUT. Gives me great results that are clean from noise. But I got the EVF to be more nimble and hand held. It's false colour ain't tuneable like the 7Q+. When I setup my exposure I made sure to check I wasn't clipping with my highlights (Red in false colour) and then it appeared to be in the 58-77IRE range (grey). I would venture a guess that the 90 degree shutter option selected might be responsible. Were you also at 90 deg setting when filming the other scene? I think it would might be lowering integration time significantly. Sorry guys, I had monitoring on the bmmcc set as video instead of film. It’s seems like the highlights are pushed up with the “video” transform. I switched it to monitor as film, and now I’m getting no surprises from when shooting to grading. Sorry everyone, including BMD, for wasting your time! I hope to post a recent project soon!